BioOne Eco-Friendly Drain Cleaner Keeps Your Family, Plumbing & The Environment SAFE! BioOne drain cleaner is the best environmental solution for wastewater. This includes drain lines, septic tanks, drain fields, grease traps and more. BioOne eco-friendly drain cleaner has the ability to degrade many stubborn inorganic & hazardous materials that may be hanging out in your pipes and/or septic system. 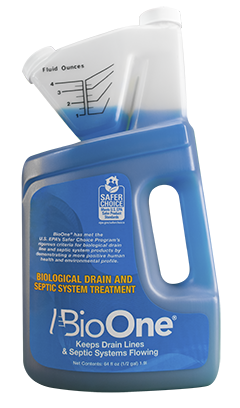 BioOne is safe for your family, pets, plumbing and the environment, bio-degradable, easy to use and is EPA Safer Choice Program recognized. For more information, please check the information tabs above, or use the form above if you’d like one of our technicians to provide you with a demo and more detailed explanation. BioOne is for sale and recommended by Houston leading plumbing contractor, Abacus Plumbing. Superior ability to degrade many stubborn inorganic & hazardous contaminants. The safest & best product to degrade FOG (fats, oils, & grease) and other organics that find their way down drains. Maintains operation and restores normal flow of drain lines, septic systems and grease traps in all types of situations. Surpasses any other product you will find in the marketplace. Manufactured to food standards even though it’s not a food product. Each batch of BioOne goes through over 100 quality control checks. 2015 EPA Safer Choice Partner of the Year Award! Preventive Maintenance: Apply 2 ounces per month directly into each drain. Slow drains: Apply 2 ounces per day directly into drain for 5 consecutive days or until drain flows freely. Septic System: Flush ½ gallon down the toilet immediately after pumping. Add 4 ounces per month to maintain system. Preventive Maintenance: Apply 4 ounces per week directly into each drain. Slow Drains: Apply 4 ounces per day directly into drain for 5 consecutive days or until drain flows freely. Grease Traps: Apply 1 gallon per month directly into grease trap. For best results, apply BioOne® during times of minimal water usage. Store at room temperature. What is the EPA Safer Choice Program? The increasing demand for environmentally friendly products stems from 85% of businesses creating sustainability initiatives, and consumers showing increased interest in environmental matters. Surveys show that consumers factor in environmental impact as part of their buying decisions. The U.S. EPA Safer Choice Program reflects the worldwide interest for environmental safety and sustainability and the purpose of the program is to help identify and develop environmentally safer products. The EPA and a 3rd-party science team conduct a rigorous review of any product applying for this program. The 3rd-party team carefully screens each ingredient for any potential human health and environmental effects and reviews their chemical structures to see how it could impact the environment and people. Only products that pass this test are sent for approval. 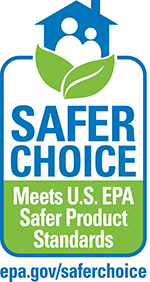 BioOne has passed the U.S. EPA’s Safer Choice Program’s criteria and proudly displays the Safer Choice logo in recognition of its positive effect on human health and the environment.